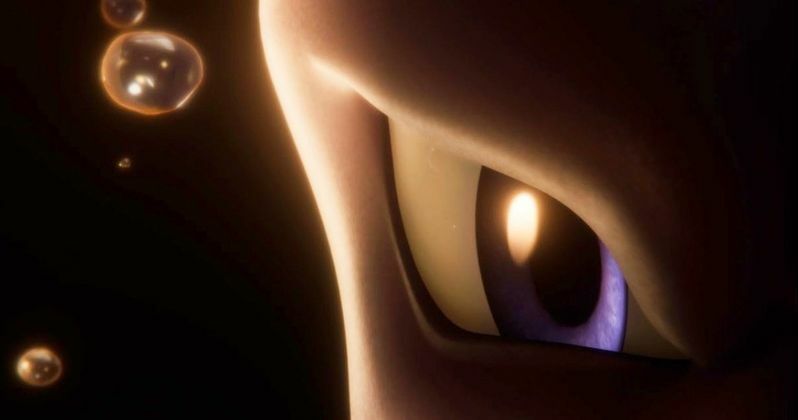 The first trailer and poster for Pokémon the Movie: Mewtwo Strikes Back Evolution have arrived online. The Pokemon brand has been going strong for more than two decades and, in that time, there have been more than twenty movies made, to go along with hundreds of episodes of the TV series, tons of playing cards and everything in between. Now, we're going back to where it all began as this first trailer reveals that the upcoming movie is actually a remake of the very first Pokemon movie from 1998. While the footage doesn't offer much of a look at the movie, as it's really just a teaser for what's to come, we do see a fully realized, 3D animated version of Mewtwo. The final shot of the teaser is something that Pokemon fans will recognize, as the Legendary Pokemon comes face-to-face high above the clouds with his counterpart, Mew. This face-off recalls the climactic battle from Pokemon: The First Movie and confirms that this is indeed going to be a remake. The poster, much like the teaser, focuses heavily on Mewtwo, bathing him in dark shadow, with his signature purple essence radiating. It had previously been suspected that the forthcoming movie was going to be a remake of the original classic, but now it's an inescapable fact. For people of a certain age, that first movie is sacred to some degree. So, as exciting as it may be to see Mewtwo in all of his 3D glory, this movie does run the risk of ruining some childhoods. But, then again, done correctly, it could bring these characters to life in a way that we've never seen before, leading to a very satisfying experience. 2019 is poised to be a huge year for Pokemon. Not only do we have this remake to look forward to, but we're also going to get the first ever live-action Pokemon movie in the form of Detective Pikachu, which hits theaters this summer on May 10. That movie sees Ryan Reynolds as the titular character investigating a crime with his human partner. As it stands, Pokemon The Movie: Mewtwo Strikes Back Evolution doesn't have a U.S. release date, but it's going to hit theaters in Japan on July 12. This isn't the first classic Pokemon movie to get the remake treatment. Pokemon: The Power of Us, served as a remake of Pokemon the Movie 2000. Kunihiko Yuyama and Motonari Sakakibara direct this latest remake, working from a screenplay by Takeshi Shudo. As the release date gets closer, we should expect to see a more revealing trailer, which will give us a better idea of what this world is going to look like in 3D animation, as opposed to what fans of the franchise are more accustomed to. Be sure to check out the trailer for Pokemon The Movie: Mewtwo Strikes Back Evolution from the Pokemon Official YouTube channel below.